The German Cockroach, Blatella germanica. Quite when and where it took up with humans and evolved its complete dependence on us is unknown but it is believed to have been somewhere in Africa, probably before we were modern humans. Its ancestors might well have lived in caves like several other species of cockroach. B. germanica has shown itself to be capable of rapidly evolving. In the 1980's the control method of choice was to use sugars laced with insecticides then, in the 1990s, this stopped being effective. Cockroaches had not, as might seem probable, evolved a resistance to, or tolerance of, insecticides; they had evolved an aversion to sugar. Under the intense selection pressure introduced by humans, those cockroaches which simply didn't like sugar survived to reproduce, passing on their aversion to sugar to their offspring, and their offspring thrived in the environment which had killed off their sugar-loving relatives. This was demonstrated in 1993 with a simple experiment by entomologist Jules Silverman who showed that this was not a learned aversion but an inherited one simply by separating newly-hatched young from their mothers and showing that they too had a sugar aversion. The actual mechanism for this aversion was only discovered in 2013 when it was shown that H. germanica had modified its neural circuitry so that the sugar glucose is now perceived by the neurones which respond to bitter tastes. Glucose now tastes bitter to these evolved cockroaches, and a sugar-detecting ability which must once have been a big advantage to cockroaches living with humans where sugars were at a premium, and which became a major disadvantage in an environment where we developed sugar-based poisons, has been switched off and now works as a deterrent, giving a distinct survival advantage in this new environment. In response to the anthropogenic assault of toxic baits, populations of the German cockroach have rapidly evolved an adaptive behavioral aversion to glucose (a phagostimulant component of baits). We hypothesized that changes in the peripheral gustatory system are responsible for glucose aversion. In both wild-type and glucose-averse (GA) cockroaches, D-fructose and D-glucose stimulated sugar–gustatory receptor neurons (GRNs), whereas the deterrent caffeine stimulated bitter-GRNs. In contrast, in GA cockroaches, D-glucose also stimulated bitter-GRNs and suppressed the responses of sugar-GRNs. Thus, D-glucose is processed as both a phagostimulant and deterrent in GA cockroaches, and this newly acquired peripheral taste sensitivity underlies glucose aversion in multiple GA populations. The rapid emergence of this highly adaptive behavior underscores the plasticity of the sensory system to adapt to rapid environmental change. 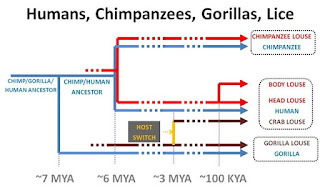 H. germanica is not the only species which has evolved to become entirely dependent on humans. Our lice have clearly evolved from a common ancestor of the lice which live on our close relatives, gorillas and chimpanzees. The human body louse, Pediculus humanus humanus, has diversified from the human head louse, Pediculus humanus capitis, probably diverging at about the time we started wearing clothes, so opening up a new niche for a species that had become restricted to our heads as we lost body hair. Studies show that these lice diverged from the chimpanzee body louse at the same time as we diverged from chimpanzees, their evolution mapping exactly onto the evolution of chimpanzees and hominids. The closest relative of the human crab or pubic louse, Phthirus pubis, normally regarded as an STI, is the gorilla louse, Phthirus gorillae, which appears to have crossed the species barrier about 3.3 million years ago. Maybe it hasn't always been an STI. For more on this see Lousy Creator. 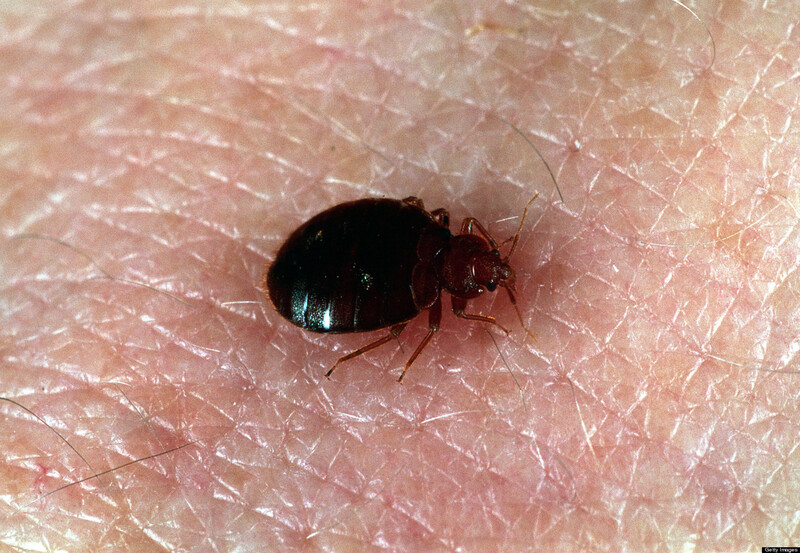 Bed bugs, currently plaguing the New York hotel industry, have probably evolved from bat bugs which live in caves and predated on bats during the day. They probably moved from bats to archaic humans somewhere in Eastern Europe about 100,000 years ago - before modern humans were on the scene. Even the common house sparrow seems to have evolved from an African sparrow, given up migrating in Spring and Autumn, evolved a larger beak and taken up residence with humans, spreading across the world with us. In North America and Hawaii, house sparrows are showing signs of geographical variation in as little as 50 years. Literally dozens of creatures including birds, rats and mice, insects, spiders, mites and other arthropods, flat and round worms, protists, bacteria, fungi and even archaea, have evolved to live on, in or alongside humans. Some of these we have acquired from domesticated animals but very many of them seem to have taken up residence when we became settled, especially sleeping in the same place every night, unlike all our great ape relatives. Unlike these other great apes which live in forests and sleep mostly in trees and so have a large choice of location available to them, we had little real choice and were probably restricted to a few safe and sheltered sites around which isolated family groups would have gathered, as we moved out of the forests and into the African savanna (or maybe the forest retreated and left us stranded). Sleeping in the same location night after night, maybe on piles of leaves or animal skins, probably huddled together, with the remains of our food scattered around, and even a plentiful supply of dead skin scales, created an ideal environment for several small creatures. Development of agriculture created an even more settled existence, with buildings, bedrooms, outhouses, threshing yards, irrigation ditches, grain stores, waste heaps and animal litter, all offering potential niches for one or more organisms to move into. An excavation of the earth floor of the home of Akhenaten's stable master, Ranefer, from 1300 BCE in the Ancient Egyptian city of Amarna, revealed a huge diversity of arthropods including grain beetle which had lost their wings and relied on humans to carry them around in bags of grain. 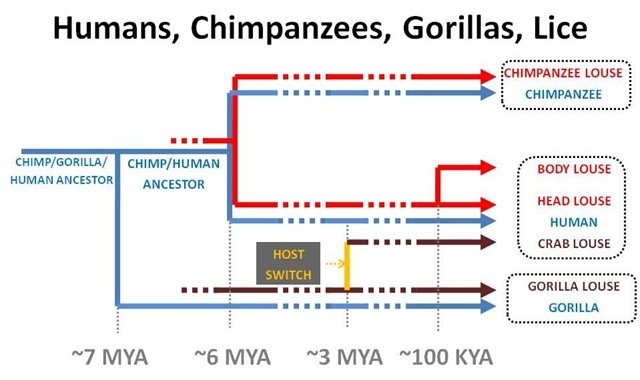 Humans have massively manipulated their environment and created so many new ecological niches that it would be surprising, given what we know of evolution, if hundreds of new species hadn't evolved to fit into them. The fact that this is exactly what we see, and the fact that, like the German cockroach, those species which were quick to occupy these niches are good at adapting, is an illustration of evolution by natural selection. Some studies have shown 8000 different species of bacteria and archaea in a single house while another (in the USA) has shown an average of about 100 and up to 760 species of arthropod living in every house. So now the questions for creationists. Given that your theologians who pose as scientists believe in a literal interpretation of your respective holy books and so believe a magic man in the sky created all living things for the benefit of humans, please explain why so many of these fellow travellers are entirely dependent on humans yet provide no benefit to us and are often harmful, either living as parasites on and in us, or eating and spoiling our food, or carrying infections which harm us, why did your supposed creator create them? Frustra fit per plura quod potest fieri per pauciora [It is futile to do with more things that which can be done with fewer]. The scientific explanation for the existence of these organisms, backed up by genetic, cladistic and archaeological evidence, is that they evolved from existing species to occupy the ecological niches created by human activity and lifestyle. None of this required the existence of magic or a magician. So how is a creationist explanation for these observable facts, which requires the inclusion of an unproven and infinitely complex entity, more vicarious than the scientific explanation, and why should the magic, unexplained, unnecessary and infinitely complex entity not be pared away and discarded using Ockham's Razor? How can creationists continue believing in their divine creation rubbish? I think they in some way or other are "addicted" to their brains's preverbal, prelogical, naive, ingenuous, emotional, magical and religious thought paradigm (a.k.a. information processing system #1 = IPS 1) via a kind of brain priming process. That is, you believe (at least partly) since you've always been a believer since early childhood (because of both genetic and environmental reasons). Here are two intriguing articles supporting my point of view: 1) http://www.skeptic.com/eskeptic/14-01-15/#feature (Bigfoot or Baloney? Confessions of a Bigfoot Hunter. By Jonathan Blais. ); and 2) http://www.skeptic.com/eskeptic/14-08-27/ (The Thinking Atheist Confesses. By Donald R. Prothero). What if creationists on a regular basis started following Rosa's blog? Would that experience deliver them from being gullible and stop them from believing in invisible divine entities? Maybe, maybe not.